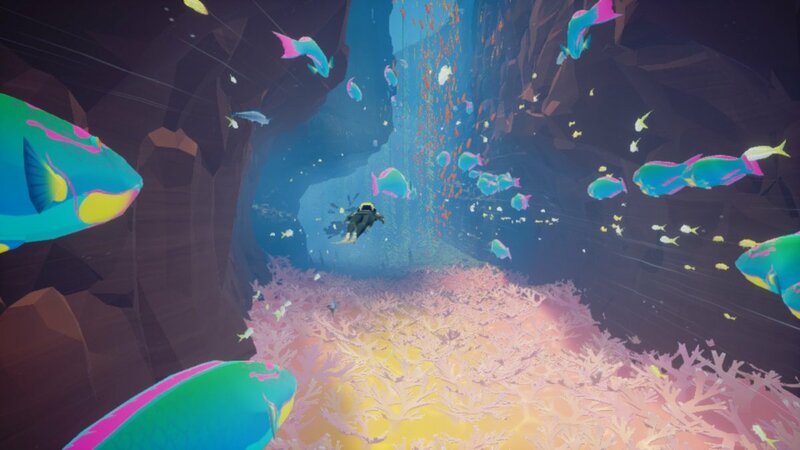 If someone ever tries to tell you that video games aren’t art, show them ABZÛ. Few games before have so vividly captured an experience. In the case of ABZÛ, Giant Squid Studios masterfully combines a dazzling, cel-shaded aesthetic and a sweeping, orchestral soundtrack to convey the depths and mystery of the ocean. That combination is key, for while each disparate element is worthy of praise on its own, the way in which they harmonize is where ABZÛ truly succeeds. ABZÛ isn’t a gameplay experience as much as it is as a sensory one. While there are light puzzle elements as you swim deeper into the ocean, by and large ABZÛ simply asks the player to casually dive through the game’s stunning environments. I played through this title with the lights off and the sound cranked way up; this was the optimal way to experience ABZÛ. In many ways, the game feels like an extended sequence from Disney’s Fantasia, because of how sounds and visuals are synchronized for maximum effect. Whether the sweeping orchestra takes on a bombastic flair as you’re gliding along an ocean current at high speed, or it takes on a lighter, awestruck vibe as you swim through a humongous, pastel-colored coral reef, the music never failed to create a feeling of grandeur. That music is complemented by perhaps my favorite cel-shaded art style of all time. The depths of ABZÛ are, in a word, dazzling. The game has a soft, pastel color palette and a pseudo-realistic style that lands somewhere between The Wind Waker and Breath of the Wild visually, which I find to be the perfect middle ground. There were many times during my playthrough of the game that I simply stopped to marvel at the world around me, which I don’t often do when playing games. To return to ABZÛ’s color palette, it uses color beautifully. Each environment is bathed in a distinct pastel hue, from the predictable blues and greens to the more fantastical reds and oranges. That speaks to ABZÛ’s visual strength; while every area feels vibrant and distinct, they all remain cohesive. With all that said, if the idea of exploring the beautiful depths of ABZÛ isn’t enticing, the gameplay won’t sell you on this title either. However, I don’t think that is an issue. ABZÛ isn’t trying to be a gameplay experience. It is unabashedly a game about the experience, and to that effect it succeeds masterfully. I enjoyed ABZÛ to the extent that I did because of its moments of harmony: swimming alongside energetic schools of multi-colored fish, riding on the back of a lackadaisical sea turtle, or following a pod of enormous whales. These set pieces in conjunction with the aforementioned Fantasia-esque presentation were enrapturing and tranquil. That isn’t to say that ABZÛ doesn’t have a backbone though, while the majority of the adventure is rather relaxed, later portions of the title take the player into the foreboding, and legitimately tense, depths of a mechanical beast, emerging out the other side with a sequence of pure triumph. ABZÛ isn’t without its flaws though, though none are large enough to detract majorly from the overall experience. The chief issue I had with the title was its control. At times, I found swimming cumbersome, especially in conjunction with the game’s inconsistent camera. There was one moment in particular in which the camera was fixed that I found difficult to maneuver through. This issue isn’t prevalent though, only cropping up from time to time. It would’ve been nice to propel the protagonist by some other means than holding ZR though, which did become uncomfortable during my playthrough. I doubt that this would even be a nitpick when playing ABZÛ with a Pro Controller, but I played the game front to back in handheld mode. To that effect, even with large schools of fish on screen, ABZÛ ran swimmingly (pun entirely intended) with very few dropped frames. One final issue, and this could be entirely the fault of my earbuds, I did experience some audio tearing at higher volumes when the music really swelled up. Even if it is the fault of the game, it did not detract from the orchestral score at all. If I didn’t make it clear up to this point, I wholly enjoyed my time with ABZÛ. While drawing obvious inspiration from Journey, one of my favorite games of all time, I found the setting of ABZÛ absolutely enthralling, setting itself apart from Thatgamecompany’s work. The Fantasia comparison here really cannot be understated and encapsulates just why this game is so special. Sequences of this game are legitimately some of my favorite of 2018, and I absolutely plan on replaying ABZÛ soon. Clocking in at under two hours, this is the perfect experience to end a day with. Turn out the lights, turn up the sound, and enjoy. ABZÛ is nothing short of a work of art. Diving through its gorgeous cel-shaded ocean with the title’s sweeping orchestra in the background enraptured me from the first moment of the game. This is an experience that shouldn't be missed.